Happy Birthday Wolfgang (Theme and 5 Variations on Happy Birthday to You! Based on the Music of Mozart). Composed by Juliana Osinchuk. For Piano. Masterworks; Piano Solo; Solo. Form: Variations. Birthday; Recital. Early Advanced. Sheet. 16 pages. Published by Alfred Music (AP.34421).ISBN 0739066951. Birthday; Recital.The familiar song "Happy Birthday to You!" 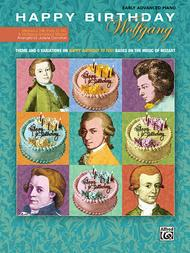 is cleverly arranged as a theme and variations in the style of Wolfgang Amadeus Mozart. The theme is reminiscent of a minuet in classical style. This is followed by five variations based on famous works by Mozart. Variation 1 is based on the first movement of the Piano Sonata in C Major, K. 545. Variation 2 features the first movement of the orchestral piece Eine kleine Nachtmusik, K. 525. Variation 3 uses the second movement from his Piano Concerto No. 21 in C major, K.467, known as the "Elvira Madigan" theme. "Papageno’s Aria" from the opera The Magic Flute is the basis of Variation 4. The fifth and final variation is inspired by the third movement of Mozart’s Piano Sonata in A Major, K. 331, which is better known as "Rondo alla Turca. ".